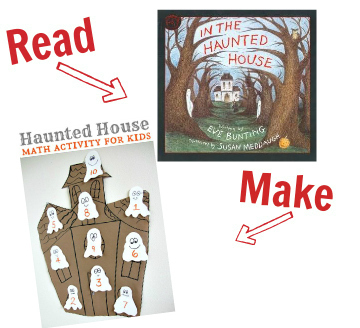 It’s October and it’s time to plan a few ( or many ) fun Halloween crafts to get excited about the holiday and learn at the same time. 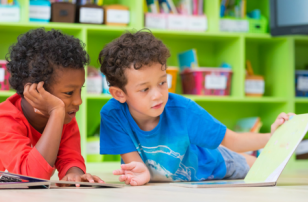 Each one of these books has been paired with a great craft or activity that work on a variety of skills in a playful way. Click on the book title and you will be taken to Amazon through and affiliate link to check out the book. 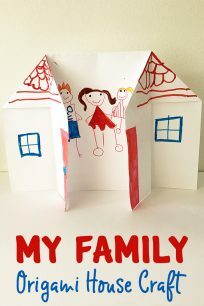 Click on the craft and you will be taken to the full craft tutorial so you can see the step by step instructions to make it with your child. 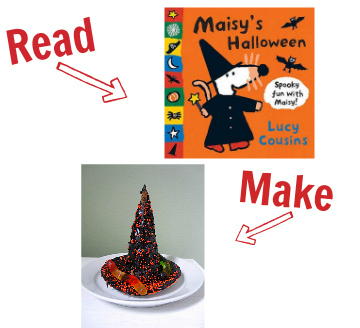 Did we miss one of your favorite Halloween books and crafts ? 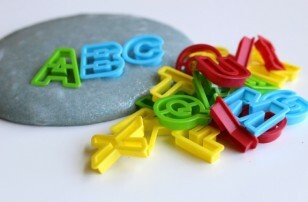 Add them in comments so we can make this resource even more helpful. 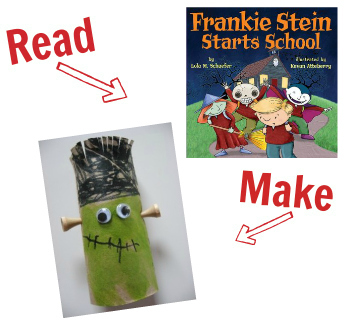 Frankie Stein Starts School by Lola M. Schaefer and our TP Roll Frankenstein. 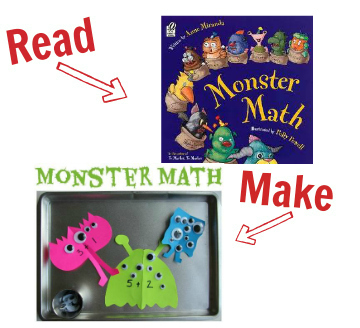 Monster Math by Anne Miranda and our Monster Math activity. 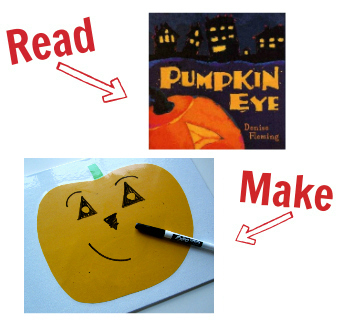 Pumpkin Eye by Denise Fleming is a perfect match for our Dry Erase Pumpkin. Ghosts in the House! by Kazuno Kohara and our Puffy Paint Ghost. 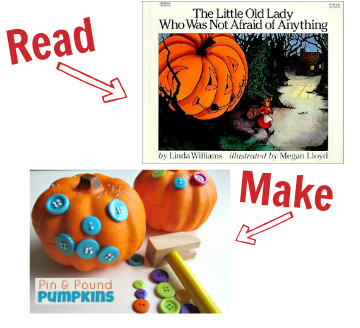 The Little Old Lady Who Was Not Afraid of Anything by Linda D. Williams and our Pin and Pound Pumpkins. 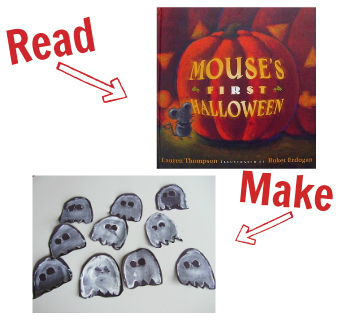 Mouse”™s First Halloween by Lauren Thompson and Potato Print Ghosts. 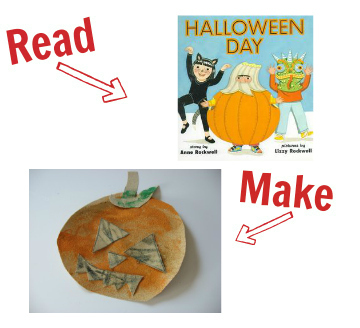 Halloween Day by Anne Rockwell and our Touch and Feel Sandpaper Pumpkin. 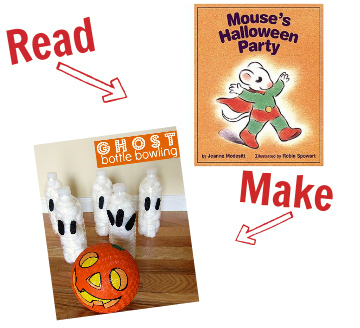 Mouse”™s Halloween Party by Jeanne Modesitt and our Halloween party game Ghost Bottle Bowling. 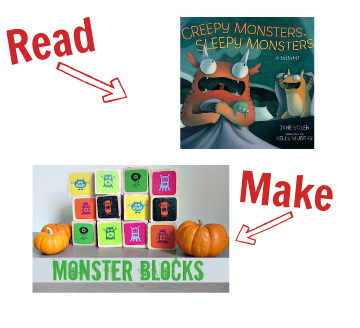 Creepy Monsters, Sleepy Monsters by Jane Yolen and super fun Monster Blocks Memory Game. Where Is Baby”™s Pumpkin? 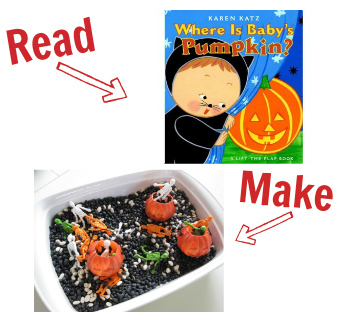 by Karen Katz and Halloween Sensory Bin. Peek-a-Boooo! 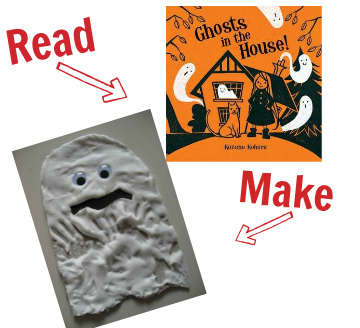 by Marie Torres Cimarusti and our Toddler Texture Ghost Craft. Inside a House That Is Haunted by Alyssa Satin Capucilli and Magnetic Haunted House. 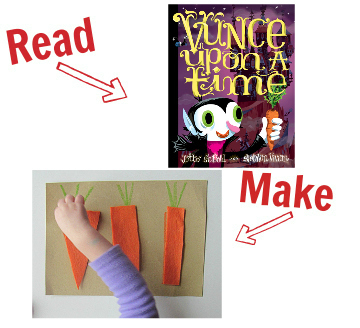 Vunce Upon a Time by J. Otto Siebold and Siobhan Vivian and our Sandpaper and Felt Carrot Puzzle. 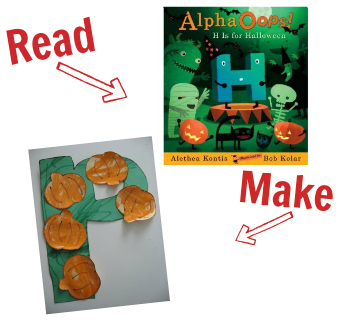 AlphaOops: H Is for Halloween by Althea Kontis and Letter P is for Pumpkin. 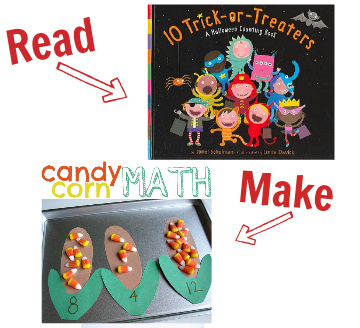 10 Trick-or-Treaters by Janet Schulman and Candy Corn Math. 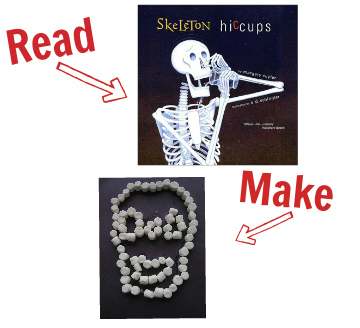 Skeleton Hiccups by Margery Cuyler and Marshmallow Skull Craft. There Was an Old Lady Who Swallowed a Bat! 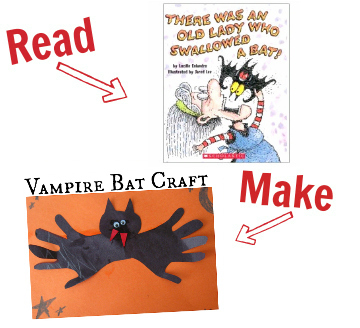 by Lucille Colandro and Vampire Bat Craft. 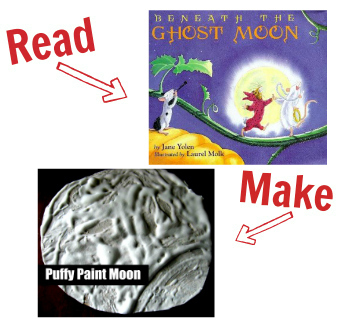 Beneath the Ghost Moon by Jane Yolen and Puffy Paint Moon Craft. 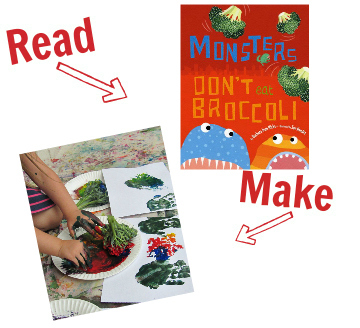 Monsters Don”™t Eat Broccoli by Barbara Jean Hicks and our Broccoli Painting. 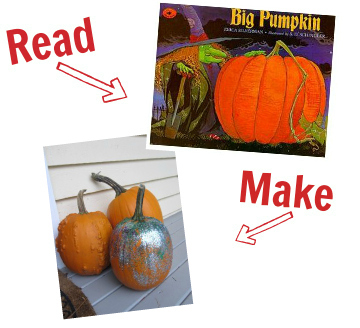 Big Pumpkin by Erica Silverman and our super simple Pumpkin Glittering. It”™s Pumpkin Day, Mouse! 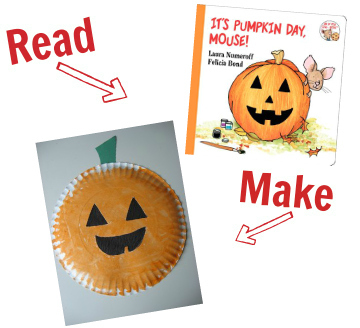 (If You Give”¦) by Laura Numeroff and our Paper Plate Pumpkin craft for toddlers. 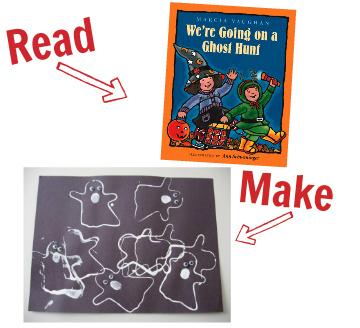 We’re Going On A Ghost Hunt by Marcia Vaughn and our Cookie Cutter Ghosts. What did we miss? 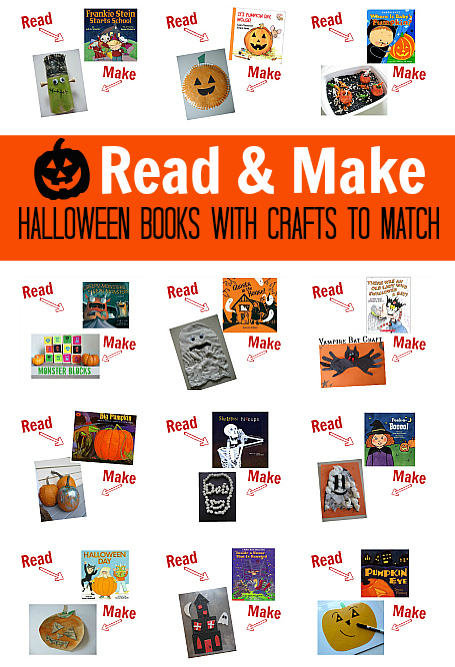 Share your favorite Halloween book or craft in comments! Piggie Pie by Margie Palatini is adorable! When I taught 2nd grade we did a play and the kids loved it! I don’t know why I always forget that book – we own it and read it often. Sometimes the most obvious right? Yes great suggestion . Thank you!! 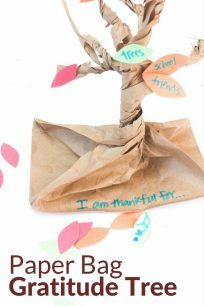 I love making crafts that go along with a book. 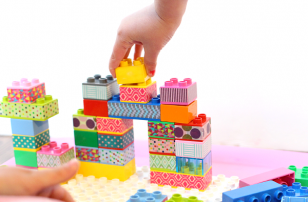 This is a great list of ideas to keep my kids busy throughout October. Thanks! 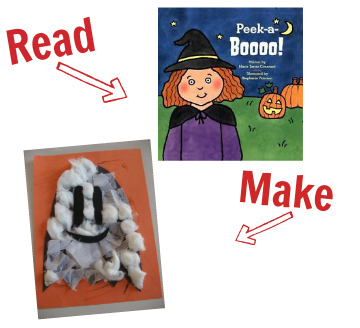 Our favorite Halloween books are Over in the Hollow, Room on the Broom, Halloween Night, and Frankenstein (a Monsterous Parody – reminds us of Madeline!). I have just reserved several of your book suggestions at the library. Hopefully our list of favorites will grow! Adorable ideas! I need to try some of these with my grandkids. We have traditions of setting out a stack of Christmas books during the month of December to read one a day as Christmas nears. But I have not thought of doing it for October until this moment. It would be fun to add the crafts. BTW, I’ve written a series of theme related treasure hunt books available at Amazon that you may like to check out. 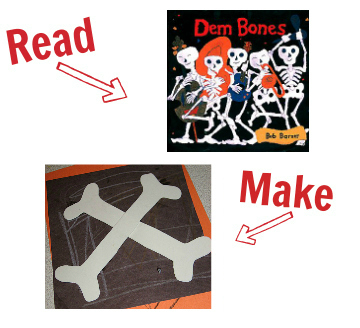 They’re ready- made clues for the children to read to take them to a hidden prize. I play this game with my grandkids for almost every holiday. Enjoying reading of any sort. 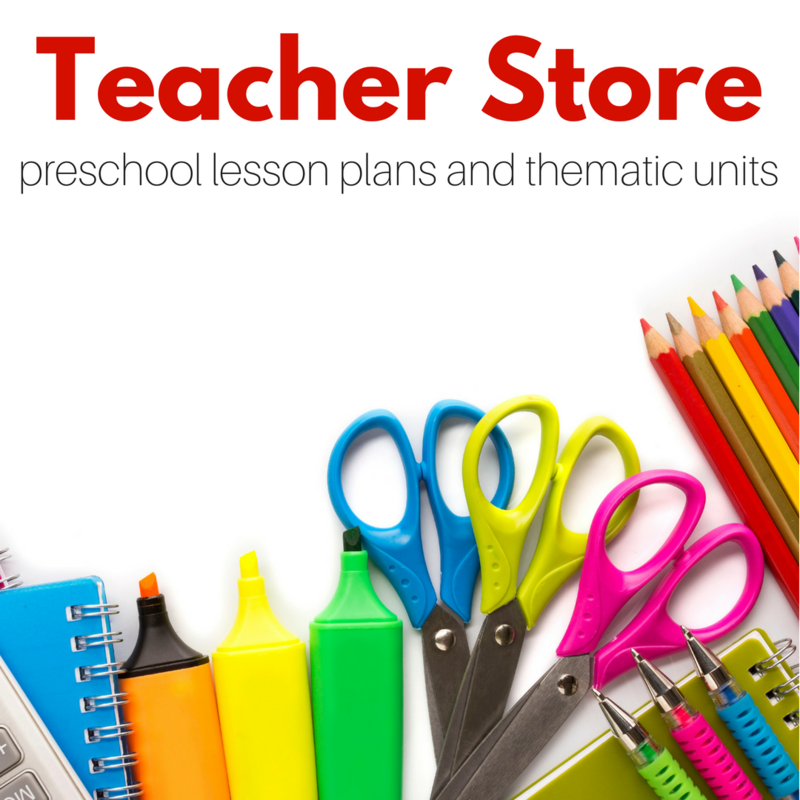 This is a great resource – thanks for sharing! My “A Harvest and Halloween Handbook” has Halloween activities, games and a preschool Mother Goose Party. 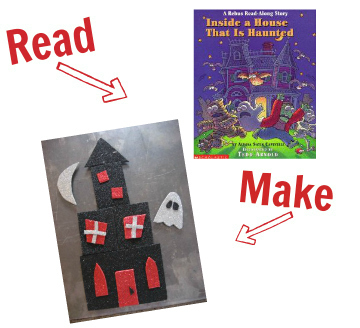 A couple of fun projects for little ones: Scrap crafts – a Jack-o’lantern, bat, spider, toad and cat made with fabric (or scrapbook paper)and buttons. 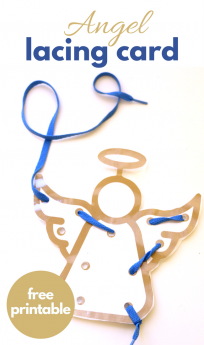 Also an invitation or card that uses a vial of bubbles and a paper chain made like a giant charm bracelet with Halloween cut-outs for charms. Keep up the good work!